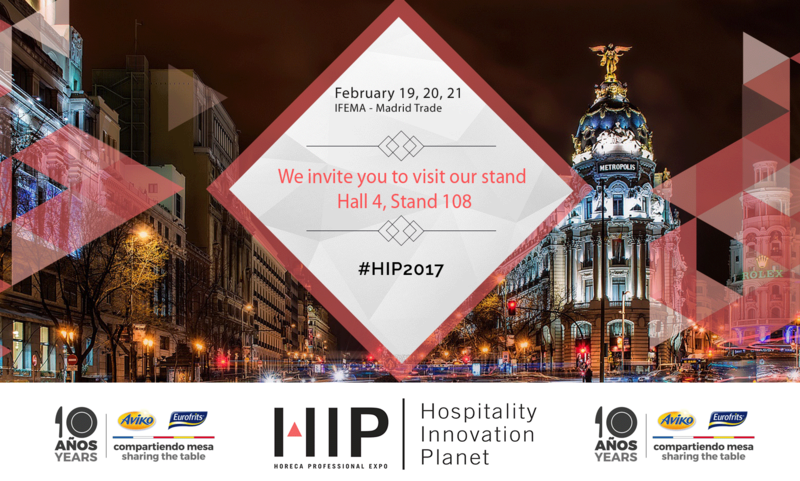 The HORECA channel is one of our main distribution channels, and for that reason Eurofrits-Aviko will participate this year in the first edition of Hospitality Innovation Planet (HIP), a new fair that brings the latest trends, innovation and new business models for hotels, restaurants and bars. We couldn´t miss this key apointment. We invite you to visit our stand (Hall 4, Stand 108) the forthcoming weekend: February 19, 20, 21 at IFEMA – Madrid Trade Fairs. We hope to see you there! Once again, our most innovative range will be the main attraction in our stand. ChefBurger, our line of Premium Burgers, will have a strong presence, since it is indeed an innovative product that offers several advantages for the HORECA channel. It is, without a doubt, a frozen product of maximum quality that can compete one on one with refrigerated products. The new Eurofrits takes a clear stand for the quality of national products, using exclusively beef meat with 100% National Origin. On top of that, in order to achieve Premium quality, the brand only uses chuck or plate, the best-suited parts to obtain a juicy and intense flavour. For its freezing process, Eurofrits employs the INDIVIDUAL QUICK FROZEN system, which guarantees the maximum quality in frozen products. That way we eliminate the alterations that occur when we freeze products, with subsequent deterioration. Hamburgers usually have a cooking time slightly superior to refrigerated products and a shelf life extending above one year. Our attendance in this Congress titled Hospitality 4.0 will revolve around the sector transformation and our new range, featuring our presentation talk “ChefBurger. Innovation in Premium Frozen Burgers”, which will take place on Sunday February 19th at 13h. as part of the fair. Hospitality Innovation Planet (HIP), expects to welcome 12,000 visitors on its first edition, aspiring to become the centre of innovations, a key date regarding trends and new business models. An event with three key areas revolving around complementary yet quite distinct concepts: BAR &Co., RESTAURANT TRENDS and HOTEL WORLD, topped with discussions on the sector transformation and challenges ahead. It´s Hospitality 4.0 for sure.